Here's the thing about me: I can see the future in flashes, like memories. But my past is a blank. I remember what I'll wear tomorrow, and an argument that won't happen until this afternoon. But I don't know what I ate for dinner last night. I get by with the help of notes, my mom and my best friend Jamie, and the system works . . . Until now. Everything's falling apart. Jamie's going of the rails. My mom is lying to me. And I can't see the boy I adore in my future. But today, I love him. And I never want to forget how much . 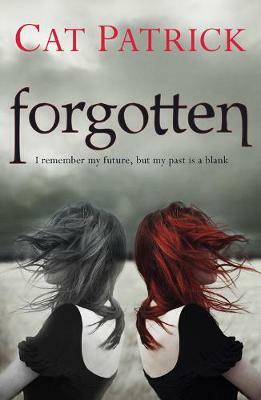 . .
Forgotten is a dark, against-the-odds romance like no other. Cat Patrick's debut novel for young adults is the perfect read for everyone who loved Rachel Ward's Numbers or Teri Terry's Slated trilogy. This is teen fiction at its most absorbing. Look out for Cat's other books: Just Like Fate (with Suzanne Young), Revived and The Originals. `A fantastic, absorbing debut that will have you reading in every spare second' - Thirst for Fiction, YA blogger. "Cat Patrick's debut won't be forgotten by readers. It's a page-turning mystery and a heartrending story of love, loss and...memories of the future. Don't miss this one." ----Gail Giles, award-winning author of "Dark Song" and "What Happened to Cass McBride?"